The main purpose of a Material Safety Data Sheet (MSDS) is to communicate to the employees the hazards of the chemicals they are working with and the preventative measures they must take to prevent exposure to these hazardous chemicals. In order for the employee to be protected, they must be aware of the hazards associated with the substance. This awareness can be achieved by reviewing the hazard identification on the MSDS. In a MSDS meeting the format required by GHS, the hazard identification section covers acute toxicity, skin irritation/corrosion, respiratory/skin sensitization, germ cell mutagenicity, carcinogenicity, reproductive toxicity, and single target organ toxicity. The Global Harmonization System classification requires label elements on the MSDS such that the employee is aware of the hazards that correspond with the labels on the product. The section also provides hazard statements that correspond with the hazard classification and serves as an explanation for the categorization. For instance, if a particular substance has a single target organ toxicity category of 1, then the hazard statement associated with this classification may state, “Causes damage to the respiratory system”. The MSDS also covers the toxicological information that may serve to warn the employee in case they exhibit any of the signs and symptoms of over-exposure to the hazardous chemical. MSDSs for active pharmaceutical ingredients can be challenging to author, but the experts at Affygility Solutions can help. Contact us today! The first aid section of the MSDS is also essential because it informs the worker of the measures they must take in case of accidental ingestion, inhalation, or dermal exposure. The accidental release measures also serve to protect the employee because it informs the employee of the methods of containment and cleaning. This information is vital because the worker must know the procedures to prevent further exposure to the hazardous chemical. This section on the MSDS also contains information that may serve to prevent release of the chemical to the environment. The MSDS informs the employee of the appropriate handling and storage of the chemical in order to prevent accidental spills or explosions. Furthermore, the MSDS emphasizes the controls that must be implemented to prevent over-exposure to the substance. For instance, the MSDS contains information on the engineering controls that are appropriate to prevent over-exposure to the chemical. If engineering controls and administrative controls are not feasible, information on the appropriate personal protective equipment is provided. Overall, the MSDS provides valuable safety information that may protect the worker in all aspects. The MSDS may prevent worker exposure in the case of accidental spills, and in regular handling. The MSDS provides control measures that may also be utilized to shield the worker from exposure to a hazardous chemical. 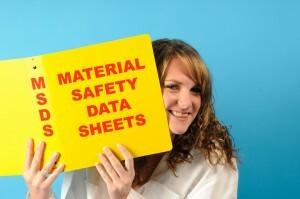 Please contact Affygility Solutions with any questions on material safety data sheets.